Origanum is best known for O. vulgare the herb we commonly call Oregano, however their is more to this genus than the common form. Here we look at ornamental Origanum plants and species, most gardeners know about the herb, however other lesser known varieties have their place in the ornamental garden as well. The ornamental types are more prolific in terms of flowers than others, some with large showy flowers in masses from spring through summer. Cultivars such as Origanum ‘Rossenkuppel’ are the ornamental varieties, well suited as ground covers for our hot climate. More readily available is Origanum ‘Santa Cruz’ with its pretty pink flowers and Origanum ‘Green Cascade’ a prostrate form, excellent for trailing over a low wall. with its purplish flowers that appear on tall wiry stem is another. This plant will reach around .5m in height with a similar spread. Deep green foliage that develops a purple tinge in cooler winters. It is the flowers that are the main attraction, from summer through to autumn small pink to purple flowers attract bees and butterflies to the garden and add constant colour. 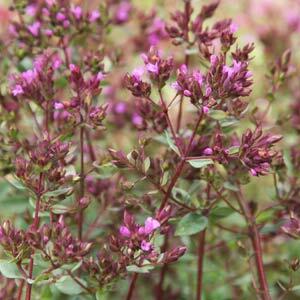 Originally from the Mediterranean origanum are easy to grow and drought tolerant once established. Drought tolerant, fairly disease free and easy to grow, well suited to Australian conditions.